Vegetable or “veggie” burgers have become commonplace as meat alternatives, joining the menu alongside hamburgers in restaurants and fast food establishments. They are no longer reserved for individuals who follow vegetarian or vegan diets. As a consumer, you should make an informed choice when deciding between vegetable and beef burgers. There are pros and cons for both options, according to Vandana Sheth, registered dietitian and spokeswoman for the American Dietetic Association. In general, you’ll get less fat and calories and more fiber in veggie burgers than in their beef counterparts. The downside is veggie burgers are higher in sodium -- although still in a moderate range -- and lower in protein. When you eat veggie burgers, you typically get three times less total fat and seven times less saturated fat than when you eat average beef burgers, according to the American Dietetic Association. You also consume 3 to 4 grams of fiber, whereas beef burgers have no fiber. 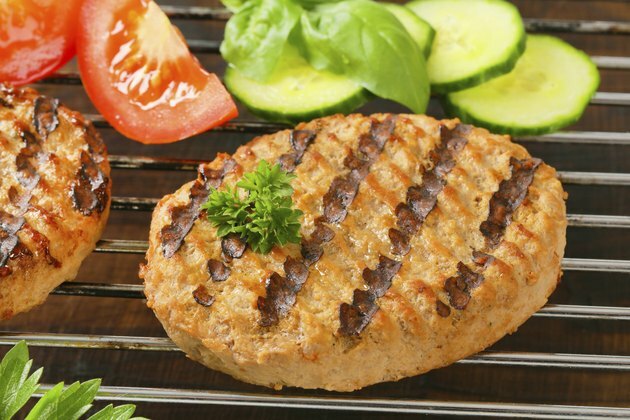 Nicole Kuhl, certified clinical nutritionist and director of nutrition at Life Span Medicine, says nutrients in commercial vegetable burgers vary from brand to brand, depending on the ingredient list. Veggie burgers normally contain fractions of soy protein, wheat gluten, corn derivatives, grains, vegetables and many artificial ingredients. If you want less sodium and more protein, you may opt for beef burgers rather than vegetable burgers. Beef contains essential nutrients such as B vitamins and minerals like iron and zinc. When you eat an unseasoned beef burger, you’ll get five times less sodium than you would in a vegetable burger, according to the American Dietetic Association. You should have at least 20 grams of protein per meal. An average beef burger has 20 grams of protein, while a vegetable burger supplies between 5 and 12 grams of protein. Kuhl cautions that beef may also contain antibiotics, hormones and toxins from chemicals on the feed. She advises buying organic, grass-fed beef to avoid harmful substances. The healthiest foods are whole foods -- those that can be hunted or gathered in nature. Although store-bought veggie burgers are convenient, Sheth says homemade vegetable burgers can be more healthful than packaged ones. You can make your own meatless burgers with herbs, spices, vegetables, beans and whole grains. Black bean veggie burgers are a good choice. Combine a 15-ounce can of black beans, 1/2 diced onion, 1/2 diced red pepper, 1/2 teaspoon cayenne pepper, 1/2 teaspoon garlic powder, 1 egg, 1 cup bread crumbs and salt and pepper to taste. Quickly pulse in a food processor or mash with a fork. Shape the mixture into patties. Spray a pan with cooking spray and cook the patties on medium heat for about 3 or 4 minutes on each side. If you have food allergies, commercially prepared veggie burgers may not be safe for you. They are processed foods and contain common food sensitivities such as soy, gluten, dairy, wheat eggs, nuts, seeds and corn. In addition, some of these foods may be genetically modified. Choose meatless products without the most common allergens and pay close attention to nutrition labels. Can You Lose Weight by Eating Veggie Burgers?